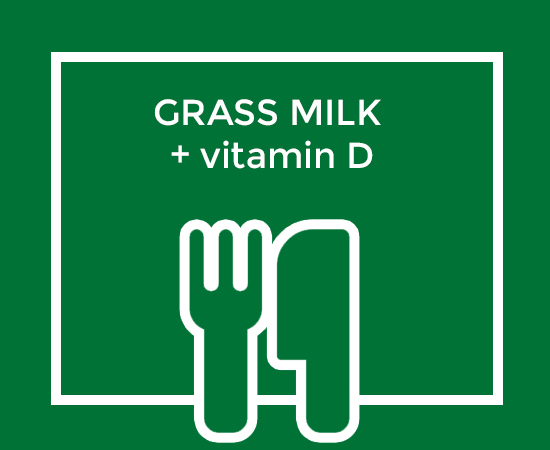 GRASS MILK + VITAMIN D - Adexgo Kft. It is well known that milk is a very important everyday food for us, it provides several nutrients which are essential for healthy living. Calcium in the milk contributes to bone formation and to the prevention of osteoporosis. Magnesium has a strengthening effect on the cardiac muscle and supports the embryo development. Lactic acid bacteria which ferment lactose to lactic acid, support the maintenance of health in the digestive system and inhibit the reproduction of pathogens that cause diarrhoea. Grass Milk+vitamin D is a food, produced by using a special feeding system, which contains more Omega-3 fatty acids (ALA, EPA, DPA, DHA) and conjugated linoleic acids (c9,t11 CLA; t10,c12 CLA) compared to other bulk milk in Hungary*. The higher amount of omega-3 and CLA contents in the milk are realised by using a natural, grass based feeding technology and by feeding a proprietary omega-3 fatty acid containing fat supplement. Besides favourable rate of fatty acids and natural vitamin D content GRASS MILK+vitamin D contains supplemented vitamin D (calciferol) as well, in the amount of min. 5 μg/0.2 L. Vitamin D regulates the concentration of calcium and phosphate in the bloodstream, promoting the healthy mineralization, growth and healing of bones. Vitamin D insufficiency can result in growth and developmental problems in children. Pregnant women and children need vitamin D supplementation, because their body cannot synthesise enough vitamin D from the sun exposure. One of the best sources of natural vitamin D is milk, the vitamin content of which can be further increased (GRASS MILK+vitamin D contains 3 μg/l of natural vitamin D). *Own experimental results: based on the average data of 104 raw milk samples tested between 2008 and 2010 in Hungary (=100%). Further information: Tejgazdaság, 2010. I-II. DOWNLOAD the leaflet of the product in pdf version.